Do you know what you want? How can you make sure you get it? Or rather, how can you convince others to give it to you? Almost every interaction involves negotiation, yet we often miss the cues that would allow us to make the most of these exchanges. 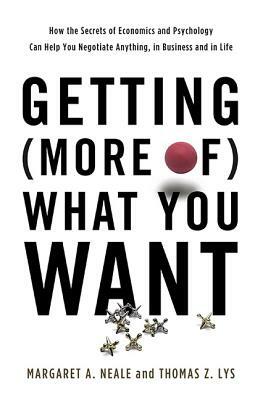 In Getting (More of) What You Want, Margaret Neale and Thomas Lys draw on the latest advances in psychology and behavioral economics to provide new strategies for negotiation that take into account people's irrational biases as well as their rational behaviors. Whether you're shopping for a car, lobbying for a raise, or simply haggling over who takes out the trash, Getting (More of) What You Want shows how negotiations regularly leave significant value on the table-and how you can claim it. Margaret A. Neale is an Adams Distinguished Professor of Management at the Graduate School of Business at Stanford University, where her research focuses primarily on negotiation and team performance. In particular, she studies cognitive and social processes in terms of effective negotiating behavior and explores the psychology behind team communication. She is the author of over 70 articles on the topics of bargaining and negotiation and is the coauthor of three books. Thomas Z. Lys is Eric L. Kohler Chair in Accounting at the Kellogg School of Management at Northwestern University. His research investigates the stock price consequences that result from alternate financial reporting standards, changes in capital structure, changes in the money supply, and corporate disclosures, and his work has been published in prominent academic journals. He is an editor of the Journal of Accounting and Economics and has served as a consultant for General Electric and IBM, among other companies. "This well-crafted book, which merges ideas and insights from the study of economics and psychology, is about how to negotiate successfully and how to maximise the value that you get from each negotiation." "Enormously important...Will serve negotiators of all sorts very well." "Getting (More Of) What You Want offers a concise and approachable deep dive into the essential truths of effective negotiating. Building off decades of behavioral research in psychology and economics, these two powerhouse professors de-bunk many common myths and lay out a disciplined approach to mastering the strategy and practice of negotiation."